PODCAST 126 IS ON THE MENU!!! Sup bro! It's a very crowded podcast, full of people, and cheer. We talk about the most exciting thing to happen to video games maybe ever...Green Day RockBand!!! we also talk who was hot on Nickelodeon when we were kids. Plus much more...Clicking this link is how you listen to this podcast! That is all for now. 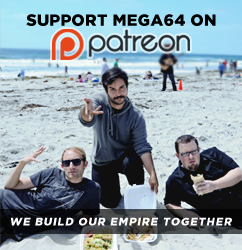 Come back on Sunday for everyone's favorite, "The Mega64 Christmas Cast!!!" What will we attempt to eat/drink this time? You got to watch to find out.